"The Wisdom Of Barnyard Bruke: "It's an Enterest'n Spring, 4-H Fellowship, a Good Young'n, Jobs, Race'n Success; Good Neighbors, Buttons"
I'm a hope'n this column finds ever one in good spirits and have'n a nice week. The rains have been spotty and as I write, some has received rain and others are dry. Maybe by the time this column comes out in the paper ever one will have received a good shower or two. Hopefully, no severe storms will have come through. The strawberry patch out back, is a produce'n and the rhubarb tastes exceptionally good already this spring. Asparagus can't be beat and with mushroom season be'n good earlier, I'm a think'n this year is off ta a good start fer us folk who likes good vittles. There are several folk out rotary hoe'n their crop, incourage'n the little seedlings satisfactory emergence. It's a hard decision, on those beans with emergence problems, fer they break their necks try'n ta get thru the crust and rotary hoe'n can break their necks as well. Some fellers feel if'n ya got's yourself a 100,000 plants per acre stand or more ya had better not replant. Anyway ya cut's it, a feller at this time of year has some hard decisions ta make. Several fellers are finish'n up harvest'n last years fall seeded cover crop of rye and triticale. Some is a bale'n it in large round bales and others are make'n silage of it by putt'n it in large plastic sax. It should make good cattle feed, especially when mixed with alfalfa hay and/or DDG's from an ethanol plant. If'n we has a dry summer and short hay crop, the extra feed will come in handy. Now, after have'n good erosion control with a good cover crop all winter and early spring, and make'n it into feed, those fellers will double crop that land into soybeans. Today's farmers shore seem ta do a good job, in this manner, with soil conservation. Each year they find more and more improvements and good ideas. The 4-H feed'n up at the Henderson County fairgrounds Saturday even'n seemed a success agin this year. It's a good place and time to meet your neighbors utilize'n the time fer a break in field work. Thank goodness fer all the volunteer helpers, both young and old alike, that makes the event a success. Ya cain't find any better vittles, either, than the pork and chicken cooked right on the spot. Shore was nice ta read in last week's Quill of Miriam Rutzen's experiences. My, but we is proud of her as represent'n our area in the best of ways! There's a labor shortage, I'm told, in some sectors of our economy, just in case your look'n fer employment. Good truckers are hard ta find and with several fertilizer plants be'n built, good laborer's are in want as well. There are plenty of good jobs a wait'n in North Dakota and Texas. We hate to see good folk leave'n the community but, if'n they's a need'n a good job, sometimes it's necessary. Hopefully they'll come back later on ta the benefit of our western Illinois area. Congratulations to Kevin Hetrick on his race'n success. It's good to see a local feller do'n well. Bob Cole and Kenneth Corzatt's pass'n leaves a hole'n our communities. They'll be missed and were fine men. Both go back in time to another pleasant era of rural life, when they was younger. A lot of times this column is on farmers concerns. Well, this time I'm a putt'n a poem in fer the women folk, especially fer those who has a taste fer sew'n. "I wonder how this came to be?" In every little stitch she makes. Bright visions of a happy pair. Buttons are closely linked to joy. From every vacant space and tear. "How sturdy they have grown to be! The shirts and things they have to wear." When mother's sewing buttons on. 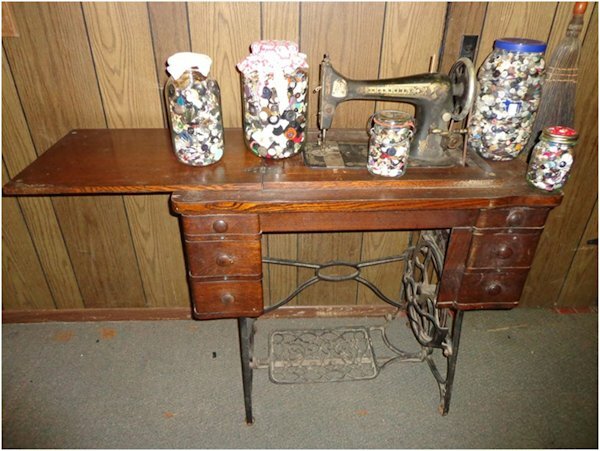 I'm include'n a picture of "Ma Brukes" collection of buttons, five jars full and more taken on her ole treadle sew'n machine. It seems ta be maybe a lost art, but no one around these parts has an excuse fer not find'n a button of their need of any kind-just contact "Ma Bruke". The button collection goes back many years through several generations of mother's button sew'n. Well, that's it fer this week. Hope'n ta see ya in church this week and try'n visit a neighbor as well as an ole friend in the nurse'n. Let them not be gone nor seemingly forgotten! !